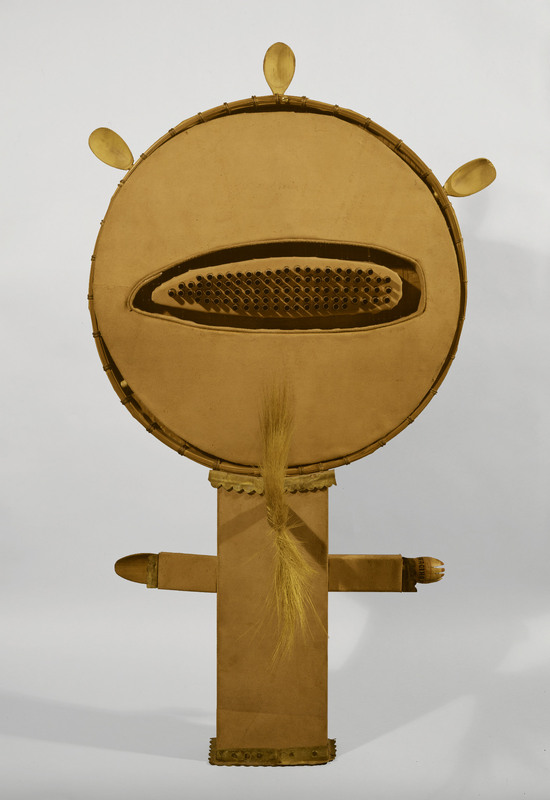 Made from wooden spoons, leather, hair, brass, and copper, this mixed-media sculpture suggests a cross between a Ghanaian akua'ba and a Hopi kachina. The akua'ba is a Ghanaian fertility doll that Asante women carry on their backs. The round shape of the head and the wide neck symbolize beauty to the Asante. Kachinas are effigies made in the likeness of the masked spirits of the Hopi tribe. This work was first shown in the exhibition Contemporary Black Artists in America at the Whitney Museum of American Art in 1970. "Untitled." Now Dig This! Art in Black Los Angeles, 1960–1980 Digital Archive. Los Angeles: Hammer Museum, 2016. https://hammer.ucla.edu/now-dig-this/art/untitled-purifoy.